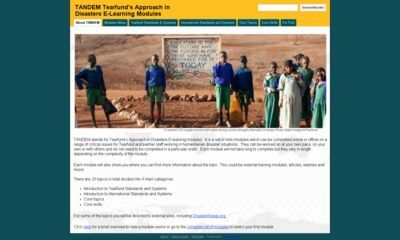 TANDEM stands for Tearfund’s Approach in Disasters E-learning modules. It is a set of mini-modules which can be completed online or offline on a range of critical issues for Tearfund and partner staff working in humanitarian disaster situations. They can be worked on at your own pace, on your own or with others and do not need to be completed in a particular order. Each module will not take long to complete but they vary in length depending on the complexity of the module. Each module will also show you where you can find more information about the topic. This could be external training modules, articles, webites and more!